Police have issued a warning to would-be troublemakers after anti-social behaviour in Carrick last night. 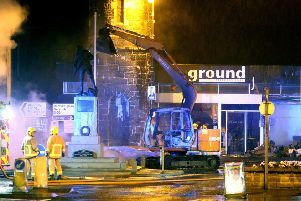 Detailing the incident, Inspector Michael Simpson said: “Last night Police in Carrickfergus dealt with a large group of teenagers who were causing antisocial behaviour. “This started at McDonald’s in Carrick and ended up at the train station. It is believed that some of these kids are travelling from both Greenisland and Larne. The group consisted of both males and females in their early teens. Inspector Simpson added: “Parents I would appeal to you to actively take an interest in where your son or daughter is at night. Police currently have extra patrols on duty in the run up to Christmas who have been tasked to tackle this issue.